Aim: We assessed the wire behavior by using intravascular ultrasound when knuckle wire technique is performed for chronic total occlusion of the superficial femoral artery. We investigate the relationship between the angiogram and the wire behavior. Methods: This retrospective multicenter study enrolled 48 patients (50 limbs) in whom intravascular ultrasound could be performed successfully after knuckle wire technique. Results: The wire passed intraluminally from the proximal cap to the reentry site in nine cases (18%). Once the wire entered the subintimal space, it remained in the subintimal space through the occlusion (32/34 cases; 95%). Conclusion: The wire was more likely to advance intraluminally if the chronic total occlusion had a tapered proximal cap and an abrupt distal margin. Subintimal angioplasty was first proposed by Bolia in 1989 and has since become popular worldwide as one of the major strategies employed in endovascular therapy (EVT) for superficial femoral artery (SFA)–chronic total occlusion (CTO), currently being adopted by many operators as a first-line strategy [1–4]. One reason why subintimal angioplasty has become so popular is its high technical success rate, ranging from 74 to 92% [5–8]. Another reason is that the wire can be easily pulled back from the subintimal (extraplaque/ extraluminal) space at the distal end of the CTO by using re-entry devices [9–12]. For the crossing of long total occlusions, some interventionists prefer subintimal approach from the beginning, whereas others will start intraluminally, and the interventionists usually guess on how the wire traverses by its behavior during passage. Although it is difficult to determine by angiography whether the wire is located intraluminally at the proximal margin of the CTO, within the CTO and at the distal margin, intravascular ultrasound (IVUS) may be helpful for detecting the wire position inside the artery. However, there have been no reports about the use of IVUS to assess the position of the wire during knuckle wire technique for SFA–CTO. We confirmed the wire behavior whether it is intraluminal or in the subintimal space by using IVUS when knuckle wire technique is performed for CTO of the SFA. We investigated the relationship between the angiogram and the wire behavior, and what type of CTO the wire is likely to advance intraluminally. This was a prospective multicenter study conducted at four hospitals. A total consecutive 48 patients (50 limbs) with intermittent claudication and/or severe ischemia were identified who underwent EVT for SFA occlusion between July 2007 and October 2008. All patients were enrolled who underwent the knuckle wire technique, with IVUS being performed after wire crossing. The following patients were excluded from this study: patients in Rutherford class 0, patients with in-stent restenosis and patients in whom IVUS was attempted after wire crossing but images could not be obtained. This study was conducted in accordance with the Declaration of Helsinki and informed consents were obtained from all patients enrolled at the time of treatment. CTO lesions of the SFA were evaluated by duplex ultrasonography, CT angiography and digital subtraction angiography. The method of revascularization, surgical bypass or EVT, was decided by consensus between certified vascular surgeons and interventionists. All EVT procedures were performed by coronary interventionists. Under local anesthesia, puncture of the ipsilateral or contralateral common femoral artery was done for the antegrade or puncture of the popliteal artery was done for retrograde approach, with the choice of approach depending on the operator. Aspirin (100 mg/day) and clopidogrel (75 mg/day) were administered from at least 7 days prior to EVT and 5000 IU of heparin was injected just before the procedure. A 6-Fr guiding sheath was used. As described previously, the knuckle wire technique was employed using a 0.035-inch J-shaped wire with hydrophilic coating and a balloon catheter or a hydrophilic catheter as a back-up without the re-entry device. After the wire had crossed the lesion, a balloon catheter or a hydrophilic catheter also crossed the lesion following a 0.035-inch J-shaped wire, and then we changed the 0.035-inch wire to 0.014-inch wire or 0.018-inch wire. IVUS was performed to observe the artery, and then balloon dilation or stent implantation (when dissection was detected) was done. Revascularization was defined as successful when the residual stenosis was 30% or less on the postprocedural angiogram and contrast medium flowed freely into the below-the-knee arteries without latency. In all patients, IVUS was performed with an Eagle Eye® Platinum Catheter (Volcano Corp., CA, USA). IVUS images were obtained from more than 5 mm distal to more than 5 mm proximal to the lesion as the IVUS catheter was pulled back automatically (pulled back speed: 1 mm/s, R100 Pullback Device, Volcano Corp.). The images obtained at three sites (at the proximal cap, within the CTO, and at the distal margin) were observed to determine whether the guidewire was positioned in the intraluminal (intraplaque) space or in the subintimal (extraplaque/extraluminal) space. The term ‘intraluminal’ was defined as the wire and the IVUS transducer being located inside the internal elastic lamina or inside the media. Also, the term ‘subintimal’ literally has the same meaning as ‘extraluminal’ or ‘extraplaque’, and ‘subintimal’ was defined as a state in which the IVUS transducer was located outside of external elastic lamina. The IVUS images were analyzed by at least two certified physicians. On IVUS images and angiograms, the ‘proximal’ and ‘distal’ of CTO were dependent on the approach site, proximal lesion is the near side of puncture site. If a lesion was performed knuckle wire technique retrogradely via popliteal artery, CTO of popliteal side is a proximal and CFA side is a distal side. Lesion proximal is always the near side of a puncture site. 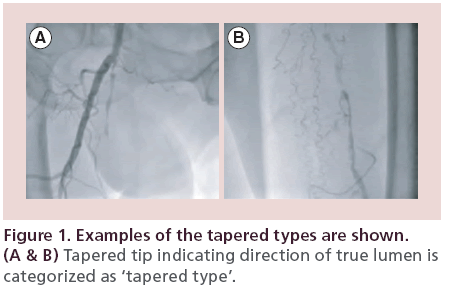 The ‘tapered type’ and ‘abrupt type’ of CTO were shown in Figures 1 & 2, respectively. Figure 1: Examples of the tapered types are shown. (A & B) Tapered tip indicating direction of true lumen is categorized as ‘tapered type’. Figure 2: Examples of the abrupt types are shown. (A & B) Blunt type indicating direction of true lumen is categorized as ‘abrupt type’. Results are reported as the mean ± standard deviation. The t-test and the χ2 test were used for statistical analyses. A probability (p) value of less than 0.05 was considered to indicate significance. Statistical analysis was performed using the SPSS software (version 11.5; IBM Corporation, NY, USA). Between July 2007 and October 2008, total 48 patients (50 limbs) were enrolled. 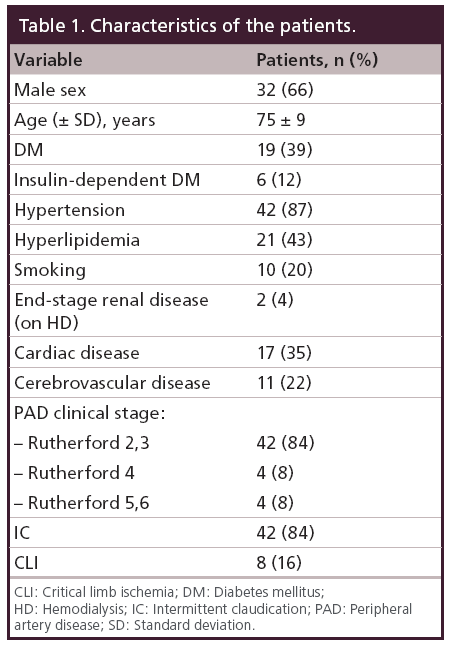 Patient characteristics are shown in Table 1. The lesion and procedural features are shown in Table 2. 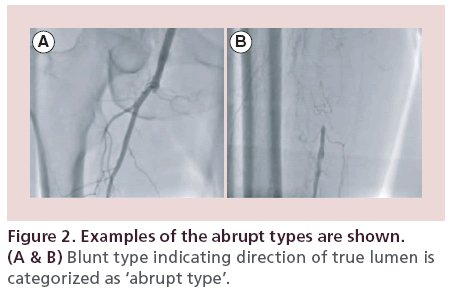 The angiogram findings depending on the definition have been shown in Table 3. Table 4 summarizes the IVUS findings. In nine patients (18%), the wire passed through the intraluminal space from the proximal cap to the distal margin. Once the wire entered the subintimal space at the proximal cap, the wire remained in the subintimal space through the occlusion (32/34 cases; 95%). When we compared the frequency of the wire passing intraluminally at the proximal cap according to CTO morphology, the tapered proximal cap showed a significantly higher rate than the abrupt proximal cap (56.2% [9/16] vs 20.5% [7/34]; p = 0.02). We also compared the two CTO types at the distal margin, and found that there was a significantly higher rate of intraluminal wire passage with the abrupt distal margin than the tapered distal margin (35.4% [11/31] vs 5.2% [1/19]; p = 0.01), as shown in Table 5. We assessed the placement of wire back to the intraluminal space when the wire entered subintimal space, and compared the percent plaque area at the re-entry site between abrupt type and tapered type. There was no significant difference of the percent plaque area (% plaque area) at the re-entry site between the two types (52.4 ± 6.6% for the abrupt type vs 46.8 ± 14.6% for the tapered type; p = not significant), as shown in Table 6. We compared the distance between the CTO distal margin and the re-entry site between the two types of distal margin, except 12 cases passing through the intraluminal space at the distal margin. 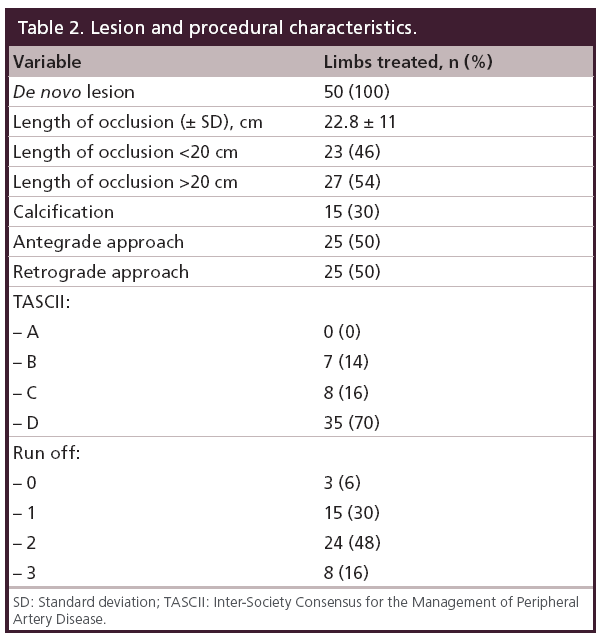 It was significantly shorter for the abrupt distal margin than the tapered distal margin (2.9 ± 1.6 vs 21.2 ± 3.4 mm; p < 0.01), as shown in Table 6. Having calcification or length of occlusion greater than 20 cm had no significant impact on the frequency of the wire passing intraluminally, as shown in Table 7. Table 2: Lesion and procedural characteristics. Table 4: Intravascular ultrasound findings. Table 5: Influence of the lesion type. Table 6: Plaque burden and distance to re-entry. Table 7: Intraluminal rate: the percentage of wires passing intraluminally. This is the first study to show how the wire passed in SFA long occlusion by IVUS when the knuckle wire technique was performed. The wire did not always pass through the subintimal (extraplaque) space. In fact, it passed through the intraluminal (intraplaque) space from the proximal cap to the distal margin in nine of 50 CTO lesions. Among 34 cases in which the wire entered the subintimal space at the proximal cap, it passed through the subintimal space from the proximal to the distal margin of the CTO in 32 cases (95%), suggesting that it is difficult to maneuver the wire back to the intraluminal space inside the CTO once it has become subintimal. In patients with either type of CTO, the wire could be returned to the intraluminal space at sites with a relatively normal lumen and less plaque on IVUS. With the tapered distal margin, the distance between the CTO distal margin and the re-entry site is significantly longer than the abrupt distal margin. According to these findings, for these tapered distal margin cases using the re-entry device would make the distance between the CTO distal margin and the re-entry site shorter, be effective. The wire sometimes passes through the intraluminal space when knuckle wire technique is performed for CTO of the SFA. The wire was more likely to advance intraluminally if the CTO had a tapered proximal cap and an abrupt distal margin. If the stent was deployed at the subintimal space, the stent needed a strong radial force. If not, the stent was easy to fracture and caused restenosis. Now the stent that we can use does not have a strong radial force. That is why we believe that deploying the stent to intimal space is better and knuckle wire technique should be performed only when the CTO lesion is tapered proximal and abrupt distal. If distal margin is tapered type, we should use re-entry device. The authors state that they have obtained appropriate institutional review board approval or have followed the principles outlined in the Declaration of Helsinki for all human or animal experimental investigations. In addition, for investigations involving human subjects, informed consent has been obtained from the participants involved. • No one knows the position of the wire during knuckle wire technique for superficial femoral artery–chronic total occlusion. • Once the wire entered the subintimal space at the proximal cap, the wire remains in the subintimal space through the occlusion (32/34 cases; 95%). • The wire was more likely to advance intraluminally if the chronic total occlusion had a tapered proximal cap and an abrupt distal margin. London NJ, Srinivasan R, Naylor AR et al. Subintimal angioplasty of femoropopliteal artery occlusion: the long-term results. Eur. J. Vasc. Surg. 8(2), 148–155 (1994). Bolia A, Miles KA, Brennan J, Bell PR. Percutaneous transluminal angioplasty of occlusions of the femoral popliteal arteries by subintimal dissection. Cardiovasc. Interv. Radiol. 13(6), 357–363 (1992). •• First manuscript to show the efficacy of subintimal angioplasty. Siablis D, Diamontopoulos A, Katsanos K et al. Subintimal angioplasty of long chronic total femoropopliteal occlusions: long-term outcomes, predictors of angiographic restenosis, and role of stenting. Cardiovasc. Interv. Radiol. 35, 483–490 (2012). • Shows critical limb ischemia was the only adverse predictor for decreased primary patency. Kesson MA, Riva L, Ivancev K et al. Subintimal angioplasty of infrainguinal arterial occlusions for critical limb ischemia: long-term patency and clinical efficacy. J. Endovasc. Ther. 14, 444–451 (2007). • Showed long-term patency and clinical efficacy and said TASC classification and length of the subintimal angioplasty were of poor predictive value. Ingle H, Nasim A, Bolia A et al. Subintimal angioplasty of isolated infragenicular vessels in lower limb ischemia: long-term results. J. Endovasc. Ther. 9, 411–416 (2002). Lazaris AM, Tsiamis AC, Fishwick G, Bolia A, Bell PR. Clinical outcome of primary infrainguinal subintimal angioplasty in diabetic patients with critical lower limb ischemia. J. Endovasc. Ther. 11, 447–453 (2004). Desgranges P, Boufi M, Lapeyre M et al. Subintimal angioplasty: feasible and durable. Eur. J. Vasc. Endovasc. Surg. 28, 138–141 (2004). Met R, Van Lieden KP, Koelemay MJ et al. Subintimal angioplasty for peripheral arterial occlusive disease: a systematic review. Cardiovasc. Interv. Radiol. 31(4), 687–697 (2008). Husmann M, Federe J, Keo HH et al. Bailout revascularization of chronic femoral artery occlusions with the new Outback catheter following failed conventional endovascular intervention. J. Endovasc. Ther. 16, 206–212 (2009). Charalambous N, Schafer PJ, Trentmann J et al. Percutaneous intraluminal recanalization of long, chronic superficial femoral and popliteal occlusion using the Frontrunner XP CTO device: asingle-center experience. Cardiovasc. Intervent. Radiol. 33(1), 25–33 (2009). Noory E, Rastan A, Schwarzwalder U et al. Retrograde transpopliteal recanalization of chronic superficial femoral artery occlusion after failed re-entry during antegrade subintimal angioplasty. J. Endovasc. Ther. 16, 619–623 (2009). Sangiorgi G, Lauria G, Airoldi F et al. Retrograde popliteal access as bail-out strategy for challenging occlusions of the superficial femoral artery: a multicenter registry. Catheter. Cardiovasc. Interv. 79(7), 1188–1193 (2012).